In ancient Greek mythology, the Titan Atlas was charged with holding up the world. Today, that task largely falls on the shoulders of American businesses. For the month of November, the Manufacturing Institute for Supply Management (ISM) reading was 58.7, marking the 18th consecutive month of manufacturing expansion in the U.S. Anything above 50.0 denotes growth, anything below, contraction. Among the areas that showed particularly strong growth were new orders and exports. But while the U.S. continues to expand, the rest of the world cools or, at best, remains in a holding pattern. The J.P.Morgan Global Manufacturing Purchasing Manager’s Index (PMI), released Monday, registered a 14-month low of 51.8. Had the U.S.’s individual score not been as strong, the global PMI number might not have exceeded the expansion threshold. The eurozone and China were the largest drags on global manufacturing. Whereas Europe registered a 50.1 for November—even usually dependable Germany scored a 17-month low of 49.5—China remained flat with a 50.0, the country’s lowest reading since May. You might wonder how this relates to oil prices. The answer: Quite a lot, actually. Just as the U.S. is the standout in manufacturing growth, it’s also now the world leader in oil production, thanks largely to hydraulic fracturing. The two combined—global slowdown and abundant oil—have prompted the rapid decline in prices. Not only is the global PMI at a 14-month low, but it also marks the fourth-consecutive month that the one-month reading has stayed below the three-month. When global manufacturing has slowed in the past, so too has oil demand, driving prices down 7 percent 100 percent of the time. Today, crude has fallen much more steeply than that—35 percent since June—but other factors have contributed to the recent slump, from the strong U.S. dollar to oversupply fears. The chart also shows that when manufacturing activity has ramped up, prices have jumped over 16 percent 100 percent of the time three months later. So short of an unexpected jumpstart to global manufacturing, how else might oil break out of its trough? Crude oil is currently down 1.2 standard deviations for the 10-year period. This might not sound like much, but as you can see, oil has rarely gone above or below one standard deviation during this time. 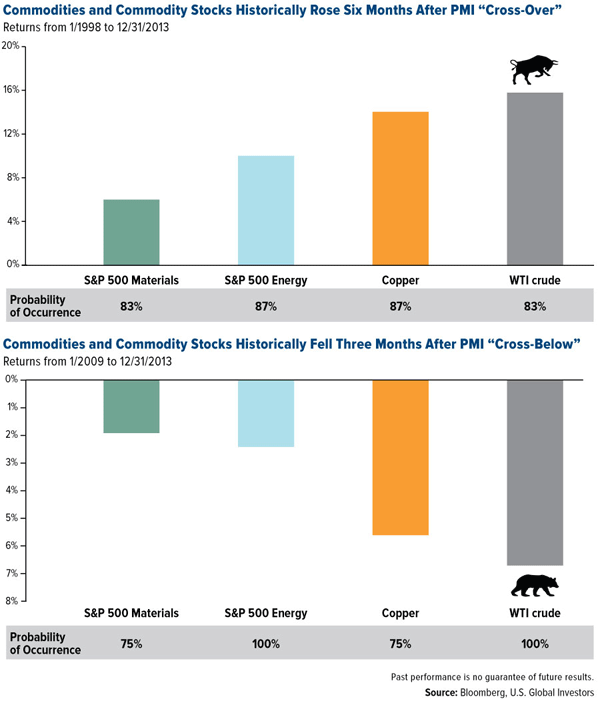 Plus, its wild volatility during the financial crisis rejiggered the commodity’s mean. Indeed, oil markets have historically been quick to recover because exploration and production become unsustainable otherwise. Several shale regions in Texas were already unprofitable at $75 per barrel. At $70, expect more companies, especially those involved in fracking and deepwater drilling, to cut production even further. The problem is, they really can’t afford to do so. It currently takes output from four or five new wells to replace the cost of one previously drilled unconventional well, which is why companies must keep up with exploration and production. And that’s just in the U.S. Many countries whose economies rely on oil exports, including Russia, Venezuela and Nigeria, will be unable to balance their budgets with $65-per-barrel oil. 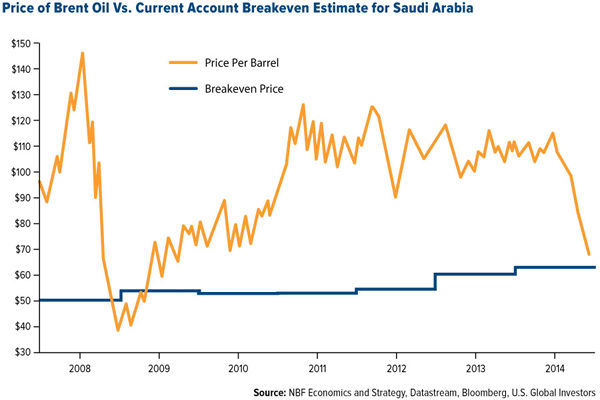 Though not yet underwater, Saudi Arabia might soon begin to feel the pinch, as Brent is getting treacherously close to the Kingdom’s breakeven price, which has risen about $10 per barrel in only five years. At the same time, many of Saudi Arabia’s traditional vertical wells can continue to operate at less than $10 per barrel. A production cut, then, is not as imperative to the Kingdom’s budget as it is to Russia’s or Venezuela’s. However, Prince Turki bin Faisal, former Saudi ambassador to the United States, stated on Tuesday that Saudi Arabia would agree to cuts only if other countries, including non-Organization of the Petroleum Exporting Countries (OPEC), participated. This indicates that, while the Kingdom doesn’t want to lose market share, it realizes action must be taken to prop up prices. And herein lies the opportunity. 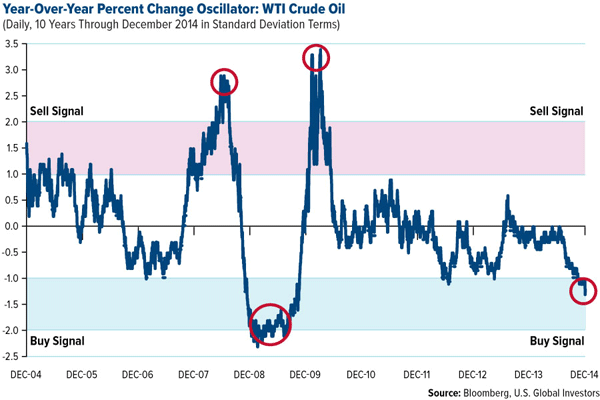 “Oil is way oversold right now on a relative strength basis,” Brian says. With the commodity at a five-year low, oil stocks are on sale, just in time for holiday shopping. ♦The ISM manufacturing composite index is a diffusion index calculated from five of the eight sub-components of a monthly survey of purchasing managers at roughly 300 manufacturing firms from 21 industries in all 50 states. 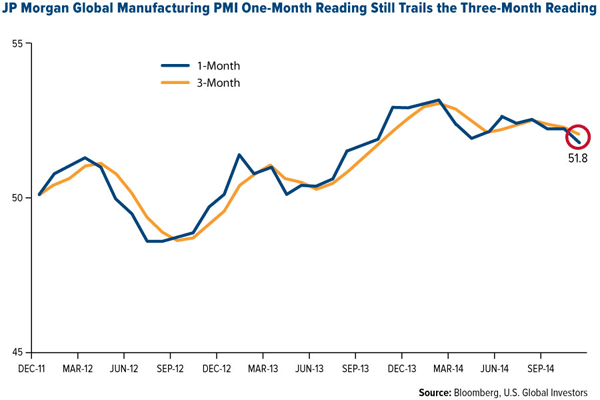 ♦The J.P. Morgan Global Purchasing Manager’s Index is an indicator of the economic health of the global manufacturing sector. The PMI index is based on five major indicators: new orders, inventory levels, production, supplier deliveries and the employment environment. ♦The S&P 500 Materials Index is a capitalization-weighted index that tracks the companies in the material sector as a subset of the S&P 500. The S&P 500 Energy Index is a capitalization-weighted index that tracks the companies in the energy sector as a subset of the S&P 500. ♦Standard deviation is a measure of the dispersion of a set of data from its mean. The more spread apart the data, the higher the deviation. Standard deviation is also known as historical volatility. ♦Fund portfolios are actively managed, and holdings may change daily. Holdings are reported as of the most recent quarter-end. Holdings in the Global Resources Fund as a percentage of net assets as of 9/30/2014: Transocean 0.00%, Oasis Petroleum 0.00%, Exxon Mobil 0.00%, Chevron Corp. 1.90%. The oil price has not yet declined to its long-term historical average, adjusted for inflation. The WTI price fell to just over $30/bbl in the 2008 financial crisis. There may be further price declines ahead. Catching falling knives leads to bleeding.